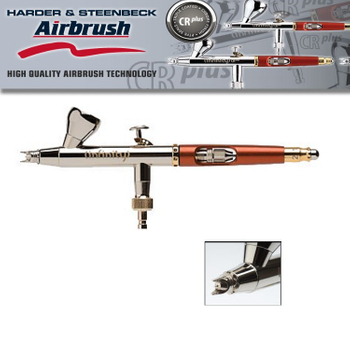 Infinity - The high-end airbrush for professional fine Art application sets new standard.Not only in design, but mainly offers intelligent function possibilities and comfort. 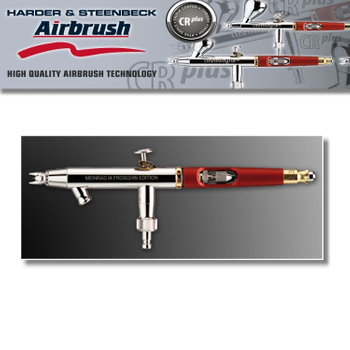 The Quick Fix possible by engraved scale of values a more accurate paint flow control. 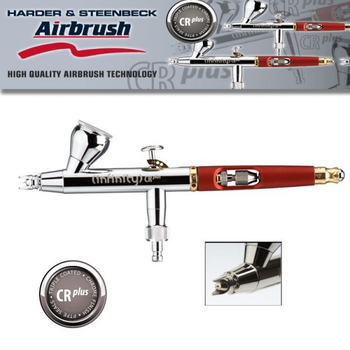 The lever resisance is individually variable and the open needle cap provides a permanent control over the needle tip. The Infinity solo comes with a 0.15 mm self-centering plug-in nozzle. The 2in1 version includes a 0.2 mm and 0.4 mm nozzle plus a larger color cup. 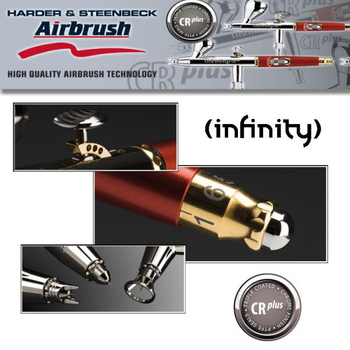 The Infinity CRplus has a triple coating of copper, nickel and high-gloss exterior chrome plating. 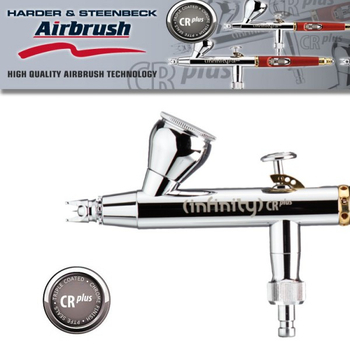 It presents itself not only in particularly high-quality optics, it is particularly suitable for nickel allergy sufferers and those users who due to hand sweat problems with oxidation have ("tarnishing") of nickel materials. The Infinity CRplus models are available with 0.15mm, 0.2 mm or 0.4 mm nozzle set or two in one variant with two sets of different sizes. An innovative long-life needle seal and PTFE seals on the cup and the valve also provide reliable protection against unwanted air and paint outlet - even with the use of solvent-based paints. "FIGHT line P 2.0 | CRplus"
Equipped with o. 2 mm nozzle or as 2in1 kit available.